I'm sure by now you've probably heard at least something about essential oils (if you don't already use them yourself) and about diffusers you can use at home to diffuse the oils into the air in your home. Until now I'd only heard of and uses ones where you add a few drops of oil to water in a diffuser. And that of course meant anytime I wanted to switch between oils I had to unplug the diffuser and wash it out so it didn't mix the new oil in with the old. Well, with the NebAir Atomizing Oil Diffuser you don't have to worry about adding water, or about the daunting task of switching between oils in the diffuser. Don't get me wrong I love my SpaGlow diffuser and will never give it up, it's perfect for my bedroom and offers a soothing glow when I'm falling asleep. During the day however in my living room I don't really need that added function, I just want a simple diffuser. With the NebAir I have that simplicity. And I can quickly and easily switch from one oil to another without having to clean out the diffuser. It comes with two empty bottles that you can fill with any oil you like, or you can use your existing bottles. However, if you find an oil is too strong for you're liking from the original bottle you can easily dilute it with some fractionated coconut oil in one of the extra bottles. The other great part is how small it is makes it very portable allowing you to take it to any room of your house with ease, or even on trips! It comes with a very simple and easy to follow instruction booklet that gets you diffusing in a matter of minutes. Below are a list of some of the great settings features it has too. 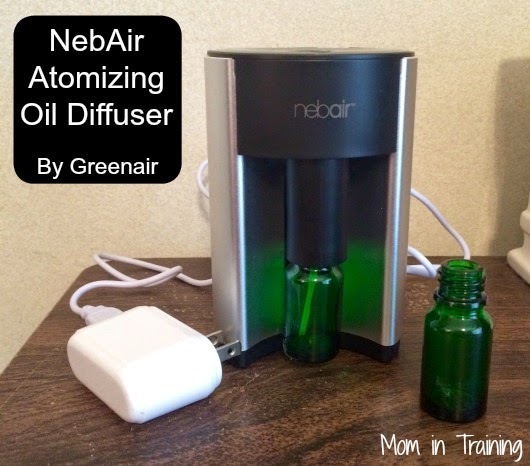 Buy it: You can find this and many other oil diffuser options on the GreenAir website. Want to win this diffuser? Then make sure you check back because I'll be giving one away during the Sweet Nothings Giveaway Hop starting at 12 AM on Thursday February 12th! I bought the nebair and have to have replacement part sent to me… My sister bought the nebair and hers does not work properly either… Be cautious buying this product because its components do not fit correctly and they will have to send you a replacement part!!! ** I would wait to buy this product until they have new piece that replaces the defective piece in the new boxes….not sure when that will be?? ?They should of did a recall on these…. I like that you can switch oils. I'm concerned about what michelle has to say about defective parts. with watching the oil diffusers video review https://yogalifestyles.com/essential-oils-diffuser-review/ and I would say it wasn't quite an easy decision, as I was looking for a diffuser that would be appropriate in the interior. Fortunately, my colleague is attending yoga, and she advised me a stylish diffuser, I really liked its functionality and appearance overall.